October 15th is coming soon and we are getting more and more excited for our Second Annual Dinner & Auction! It will take place at Diablo Country Club and tickets are still for sale! There will be dinner served, both a raffle and silent auction, and guest speakers from Camp Corda! We hope to see you all there, and are looking forward to share this event with you! This summer has been a hot and busy one here at Running with Love. From preparing for our 2nd Annual Dinner and Auction to delivering school supplies we have had a blast! We would like to thank everyone who generously donated school supplies and Boys Team Charity and National Charity League for helping us get organized for our delivery on July 30th! The kids were ecstatic picking out their backpacks, folders, markers, and the rest of their supplies! On this day we also had the joy of giving out 7 scholarships to those at the camp attending college! Tickets sales are now live for our 2nd Annual Dinner and Auction, which will be on October 15th at Diablo Country Club. We hope to see you all there! We appreciate the continued love and support! With this March newsletter comes many important highlights! As mentioned in the January newsletter we have launched our new logo focusing on the education, achievement, hope, and opportunity of Running with Love. In addition we have stepped out with new emails for the whole board, feel free to contact any of us at firstname@runningwithlove.org. The board is now finalizing the details for our April 22nd field trip! We are going to be going to Santa Clara University and an adventure spot in the area for the little kids. Lastly save the date for our second annual auction fundraiser on October 15 from 4:00-7:00pm. Thank you for the continued loved and support! This past weekend we had a board meeting to discuss plans for this upcoming year, and there is a lot! We can't wait to continue what we have done in the past and move forward to some bigger and better things! With a new year comes a new logo here at Running with Love. 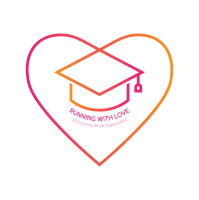 We decided to redesign our logo to represent what we believe Running with Love is, which is education, achievement, hope, and opportunity. We are all very excited about this and hope that you all enjoy it! As always we would like to thank our supporters for making 2016 such a success! We wouldn't be where we are today without your continued love and support! This year we are ending with a bang! We are busy prepping for our Christmas delivery, which will include a gift for each child, stockings filled with toiletries, and Christmas cookies. First, thanks to The Boys Team Charity, De La Salle High School, and IBM for donating all of the gifts for the both camps this year. Another thank you goes to the National Charity League for the delicious cookies that will be taken down to the camp along with the gifts and who will wrap the presents with The Boys Team Charity. Finally, thank you to the Mustang Fire soccer team for generously assembling the stockings. We are so lucky to have such great support! This Thanksgiving we were able to deliver a full Thanksgiving dinner with all the trimmings to each family at BOTH camps! We are very excited to be expanding our footprint to enable even more children make a high school diploma a reality. This past month has been a busy and exciting month for us at Running With Love. On October 16th we hosted our first annual Dinner and Auction fundraiser! This included dinner, a silent auction, raffle auction, and guest speakers from Camp Corda. These guest speakers were students from the camp who were so excited to be at the fundraiser and so appreciative of everyone’s support. We couldn't have imagined it going any better! We are happy to announce that we will now be serving another camp in addition to Camp Corda, beginning with our Thanksgiving baskets later this month! We look forward to a busy holiday season. If you would like get involved you can email runningwlove@gmail.com or follow us on social media! Tickets sales for our 1st Annual Dinner and Auction are now live. Join us for a fun evening supporting our mission. of enable the children of the migrant farm workers in Gonzales, CA to achieve a 100% high school completion rate and be college ready. Each ticket includes admission for one, dinner, two beer or wine drink tickets, and fun! Click the ticket icon below to get your tickets now. The 2016-2017 school year is off to a great start! The NCL Vista Oak chapter was once again very generous with their donation of school supplies as well as Boys Team Charity with their contributions of backpacks! NCL and Boys Team Charity not only donated but got to work sorting supplies and creating the “tickets” the children were given to then pick out their own school supplies. On August 6th we made our way to Gonzales where the children of Camp Corda were able to pick out their school supplies in our little pop up store. In addition to delivering school supplies, we were happy to be able to award four scholarships for this upcoming semester. Last but not least, save the date! October 16th will be Running with Love's first annual fundraiser at Diablo Country Club, ticket sales will be live next week. This past month we have been working hard here at Running with Love! A board member of ours, Angie Cordero, teamed up with Pick Up With a Purpose. Working together with BTC (Boys Team Charity – Alamo Chapter) we sorted and organized piles of clothes for Camp Corda and Gonzales High School. Focusing on warm coats, we were determined to make the best of everything for everyone! Be sure to save the date for our first big fall fundraiser taking place on October 16th! May 22 was a great day for the kids of Camp Corda! Our annual field trip was a huge success, leaving everyone hopeful and in high spirits! Starting the day off by visiting CSU East Bay, the high school students and middle school students toured campus while the younger kids got to play on the campus green. We were so happy to hear that one of the high school students loved the campus and had a special interest in their nursing program. Following the tour we all ate lunch prepared by National Charity League and continued our trip over to the Chabot Space and Science Center. There we went to the planetarium, learned how astronauts survive in space, went to Bill Nye's Climate Lab, and looked through telescopes. Overall it was an amazing day for everyone at Running with Love! As always, thank you for the continued love and support! Upcoming in May we have our annual field trip! Every year we pair up a college tour and a fun activity for the kids of Camp Corda. In the past we have gone to the aquarium, Santa Cruz beach boardwalk, CSU Monterey, and UC Santa Cruz. This year we are excited to be touring CSU East Bay and visiting the Chabot Space and Science Museum! The students will be able to see the college campus and everything it has to offer, and then have a fun day learning about space!. Running with Love is excited to announce that we are planning a new Annual Fundraiser Event! In October we will be hosting our first annual fall fête. This event will be replacing our semi-annual garage sale and will be a fun interactive event to enjoy. Details will be announced soon. Email runningwlove@gmail.com to get on the VIP list and be the first to know about details and ticket sales. Happy February everyone, we hope your month is going well so far! Already this month we have been privileged to visit Gonzales High School. Two of our own drove down with a truck full of clothes and school supplies, spending their day with the staff at the high school. There they talked with students and staff, discussing college visits and scholarships. We are so happy to be working with the local high school in Gonzales! Thank you all for the continued love and support! Happy New Year from everyone at Running with Love, we hope you all had an amazing holiday season with your families. With the New Year came new plans here from the board. This past week we hosted our year planning meeting and we have some exciting things to coming soon! Thank you all for your continued support, stayed tuned for what's to come! In May our field trip with the children of Camp Corda was a huge success! We started off at the campus of California State University Monterey where we took the kids on a tour. We discussed the many different majors the college has to offer and the updates being made to the campus. After the college tour we visited the Monterey Bay Aquarium, exploring the touch pools and the open sea tank. The kids had a great time doing activities and seeing all the animals the aquarium had to offer. We finished the day with a picnic on the beach and playing in the water. We are happy to have given scholarships to two students this past year. Our first student, Rigoberto has been studying Education at Hartnell Junior College in Salinas. We are extremely excited to announce Rigoberto’s transfer to San Jose State University in Spring of 2016. Our second recipient Luis, is a freshman at Chico State majoring in Agricultural Sciences. In his first semester he is studying math, chemistry, history, agriculture, and philosophy. Our annual school supply drive and delivery was another huge success. Students were given tickets for school supplies appropriate to their grade level, which they used to pick out their own school supplies that were generously donated from our supporters. Thank you! Earlier in the year a student at St. Isidore School took it upon himself to organize a sports equipment drive which was much appreciated by the children of Camp Corda. Thank you Connor Shwarz! Thanksgiving was a huge success thanks to St. Isidore School and National Charity League. With their help we delivered holiday baskets to every single family of the camp. Each basket held a turkey with all the Thanksgiving fixings, we are so glad we are able to accomplish this year after year! We are excited to once again provide stocking filled with basic necessities to the parents and fun presents delivered by Santa to the children of Camp Corda.